The Secretary General of Lebanese Islamic Resistance, Hizbullah, in his July 22 speech had admitted that he doesn’t know the the verdict in the United Nations’ Special Tribunal for Lebanon (STL) – but was informed by Lebanese Prime Minister Sa’ad Hariri that STL indictment is going to name some of Hizbullah members behind the assassination of his father Rafik Hariri in February 2005. Although, the release date of the STL indictment is not set as yet – the Israeli military chief, Lt. Gen. Gabi Ashkenazi informed Israeli Knesset that it would be in the month of September and it will indict Hizbullah for the assassination of former Lebanese PM Rafik Hariri. Is Gabi the 51st Jewish Messiah or what? The Israeli Chief of staff told the Knesset’s Foreign Committee that “with lots of wishes and a little bit of information” the situation in Lebanon will probably deteriorate following the issuance of an indictment by the Special Tribunal for Lebanon (STL) over the assassination of former PM martyr Rafiq Hariri. In September 2006, Swiss journalist Silvia Cattori interviewed German criminal investigator Jurgen Cain Kulbel. In this interview, he discusses the political role of the UN Commission and the unexploited leads pointing to Israeli responsibility. A crackdown on Israeli spy rings operating in Lebanon has resulted in more than 70 arrests over the past 18 months. Included among them are four high-ranking Lebanese Army and General Security officers—one having spied for the Mossad since 1984. A significant breakthrough in the ongoing investigation occurred in late June and culminated in the arrest of Charbel Qazzi, head of transmission and broadcasting at Alfa, one of Lebanon ’s two state-owned mobile service providers. According to the Lebanese daily As-Safir, Qazzi confessed to installing computer programs and planting electronic chips in Alfa transmitters. These could then be used by Israeli intelligence to monitor communications, locate and target individuals for assassination, and potentially deploy viruses capable of erasing recorded information in the contact lines. Qazzi’s collaboration with Israel reportedly dates back 14 years. On July 12, a second arrest at Alfa was made. Tarek al-Raba’a, an engineer and partner of Qazzi, was apprehended on charges of spying for Israel and compromising national security. A few days later, a third Alfa employee was similarly detained. Israel has refused to comment on the arrests. Nevertheless, their apparent ability to have penetrated Lebanon ’s military and telecommunication sectors has rattled the country and urgently raised security concerns. What does any of this have to do with the Hariri assassination? Outside the obvious deleterious ramifications of high-ranking Lebanese military officers working for Israel , the very legitimacy of the Special Tribunal for Lebanon (STL) is now in question. The STL is the U.N.-sanctioned body tasked with prosecuting those responsible for the assassination of the late prime minister. On Feb. 14, 2005, 1,000 kg of explosives detonated near Hariri’s passing motorcade, killing him and 21 others. Indeed, in May 2008 Lebanon experienced a taste of this. At the height of an 18-month stalemate over the formation of a national unity government under then Prime Minister Fouad Siniora, his cabinet’s decision to unilaterally declare Hezbollah’s fixed-line communication system illegal pushed the country to the brink of civil war. My old username wouldn’t work and wordpress gave me this username. Strange. Rehmat, I know from a previous article that Hariri was invited by Sarkosy to the Elysée Palace, but can you tell us what is the relationship between Hariri and Israel? Does he suspect Israel for his father’s assassination? Is he neutral? pro-Israel? 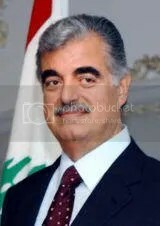 Does Hesbullah have good relations with Hariri? Rafik Hariri was born in Lebanon but became millionaire while living in Saudi Arabia. He also held Saudi Arabian citizenship. Being close to Saudi ‘royals’ means pro-American and being pro-American demands to be ‘friend of Israel’. Hafiz Assad sent his army into Lebanon on the rquest of Washington to protect Israeli interests in Lebanon. Damascus and Tel Aviv maintained ‘truce’ while Phalangist Christian militants were murdering thousands of Palestinian refugee men, women and children in Sabra and Shatila camps under the watchful eyes of Ariel Sharon’s Jewish thugs. Hizbullah, on its part, has kept a distance from all pro-USrael Lebanese factions. First 20 year of its existence – Hizbullah concentrated on social works and military resistance against Israeli occupation of Southern Lebanon. It’s only after the Jewish army was forced to vacate most of Southern Lebanon in 2000 – Hizbullah entered national politic. After the assassination of Rafik Hariri – Israel and the US blamed Syria – because Damascus was getting closer to Islamic Iran for its strategic and economic interests. However, Syria had nothing to gain by assassinating a close nationalist and secular friend. Hizbullah, on the other hand, representing the great majority of Shia population (half of country’s total population) had nothing to fear from Rafik or his pro-US son Sa’ad. Hizbullah knows that the Lebanese government need Hizbullah’s military muscle to defend the country from the Zionist entity. France created Lebanon out of Greater Syria for the Christian communities. It still has supporters among the Christian and the secularist elites. Sarkozy, like Obama, Markel and Cameron – are either of Jewish blood or Israeli puppets. They all want Hizbullah to get involved in a future Civil War and provide an opportunity for the foreign forces to get foothold in Lebanon – and thus neutralize Hizbullah as a military force – the only one which defeated Israel twice. Rehmat, thanks for your response and sorry for the delayed reply. I leaned quite a lot from this post.